As a machine shop, we can do both external and internal threading services. External threads are on the outside of the part, while internal threads are on the inside of the product. The purpose of having threads are to join parts together while providing the opportunity to assemble and disassemble in the future versus a permanent situation. Depending on requirements, internal or external may be required. Sometimes both internal and external threads are required in which case thread fit will be more assured. Our capabilities include sizes ranging from 1/4" to 4" in diameters. Our production methods consist of single point, die cut and tapping. External threads include single pointed or die cut. Single point threading is usually more time consuming and expensive but more accurate and precise. Die cut thread will be faster and more cost-effective but it is considered a functional application. Internal threading can be made by single point or with a tap. Single point threading is time-consuming and not recommended for production jobs. The reason to single point, is tooling (tap) is not available and is costly to have produced. A tap is a tool manufactured to size that will cut an internal thread. Small thread sizes are not easily single pointed so taps are the only option. The selection of the material is based on application. Our team takes into consideration the strength, weight, corrosion resistance, chemical resistance and high-temperature requirements of the part when selecting the right material. If the material selection is steel a common guide would be standard bolting material, low carbon steel, medium carbon steel and alloy steel. Additionally, mechanical properties of the part can be increased by heat treating. Below are a few common scenarios when selecting the appropriate material. If weight is important, aluminum is a good choice for lighter weight applications. Archer Engineering specializes in external & internal threaded parts for a variety of industries and applications. The most common application for threaded parts would be bolts and nuts. Having an internal and external threaded component allows things to be held together while allowing them to be taken apart in the future if needed. Another application is to move something at a consistent rate either horizontally or vertically. If the movement is horizontally it could be used to open and close something. Vertical movement could be used to raise and lower something. The externally threaded part for these applications might be called screws and the internally threaded parts could be called half nuts. Applications for threaded parts might be components or a unit by itself. Some applications are considered common and do not require tight tolerances and special finishes. Determination of requirements is based on application and end results required. Externally threaded products are bolts (hex head, square head, anchor, U and eye), screws (socket set, socket cap, square head set and machine screws), studs (full thread, double ended and single ended) and shafts. Internally threaded products consist of nuts, including hex, square, round, coupling and half nuts. 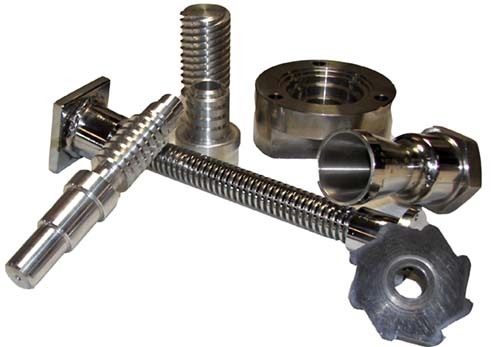 There are industry standards available for the manufacture and inspection of threaded parts. Some of them are SAE (Society of Automotive Engineers), ASTM (American Society of Testing Material), IFI (Industrial Fastener Institute), ASME (American Society of Mechanical Engineers), and MIL STD (Military standard).